While many people spend most of their time and energy on earning more, it is important to note that without learning the art of spending money well along with judicious saving and prudent investing, they may not be able to create a promising future for themselves and their families. Money plays an important role in our lives. On one side it is a tool for wealth creation for future needs and on the other it serves as a transaction instrument for satisfying present needs. While financial planning allows individuals to meet life goals by prudent management of money and finances, it may be observed that learning to manage money wisely could be the first step towards the bigger goal. Both these areas call for ascertaining the need, efficiency and time frame before getting started. Expense management is all about getting the right value for every rupee spent and appropriate decisions on the payment mode, that is, cash, cheque, credit card or equated monthly instalments (EMIs). The two can help us meet our spending needs with ease and comfort. Making a family budget which includes regular spends and one-time, even discretionary, expenses, is a way to be never out of money and save enough for life's goals. Making a family budget which includes both regular and one-time, even discretionary, expenses, is a way to be never out of money. A person with a budget will have control over his finances. He will be in a good position to manage cash flow and pay short-term dues and make provisions for other goals. The budget of one person may vary drastically from another person with a similar cash flow. This is because budget reflects our habits and aspirations. It is best to customise spending categories based on past experience and have well-defined financial goals, short-term as well as long-term. Seeking advice from a Certified Financial Planner or a CFP practitioner is the best way forward. These include grocery, electricity, fuel, phone, laundry, domestic help, eating out and entertainment expenses. As these are regular and unavoidable, you can put a broad limit so that they do not go out of control. In addition, making bulk purchases with friends and relatives may get you good discounts. Ideally, the right mode for such transactions is cash, debit card and/or credit card (only for the free-credit period). These include things like buying furniture and consumer durables, valuables like gold or going on a holiday. Since these cost a lot, one must plan intelligently. For example, while buying furniture, do a price-value analysis to determine the quality and place from where to buy. These days various payment options are available-cash discount, zero-interest EMIs, etc. Expense management is all about getting the right value for every rupee spent and appropriate decisions on the payment mode. If the seller offers zero-interest EMIs, compute the cost effectiveness by looking at hidden costs like the processing fee. The right way to make such purchases is money from planned budget which may be from the investment corpus. Credit card may be used only as a mode of payment rather than a source of finance. Impulse buying for expensive items out of budget on account of "sale", "discount", etc, should be a strict NO. In addition, one needs to wisely decide the landed cost in terms of the annual effective rate of interest. See if money can be arranged at a lower cost to get the benefit of cash discount. While making payment through credit card, make sure you can pay by the due date to avoid paying high interest. Interest rates on credit cards are much higher than on other forms of credit. As a result, credit card debt may deplete your cash resources fast. Credit cards need to be judiciously used; there should be enough money to back credit-card expenses. Else, debit card should be used. Negotiation plays a key role in saving money and getting the best deal. We should not hesitate to ask for complimentary products or services. For instance, we can negotiate room tariff in case of hotel booking or ask for complimentary breakfast, lunch and dinner and airport pick-up and drop. Consumers also have the right to demand discount on the maximum retail price printed on products. With the rise of online shopping, we can get good deals on the web. The internet allows us to compare prices of various products and services and choose the best option. Sometimes this helps us get discounts and gifts as well. For example, for books, we can visit websites like www.flipkart.com and www.amazon.com that offer these services and get the best deal. We can also rent flats and buy/sell other assets through the internet and save brokerage, which can be pretty high. This will reduce expenses to a large extent. A number of reports on consumer benefits are published these days on the basis of detailed scientific analysis and logical conclusions derived. However, these do not apply to every individual. For example, lower running expenses of diesel cars cannot be justified when we calculate the high price of diesel cars, unless it is justifiable by large distances to be travelled. Moreover, diesel cars require more maintenance and have a shorter life. Also, their resale value is less than that of petrol vehicles. In addition, while we may be inclined to be part of "Green Revolution", a similar call needs to be taken while buying energy-efficient products based on need and usage, as sometimes the cost may not be justified, for example in case of hybrid vehicles. There is a difference from the accounting perspective between an individual and a company. While the company's decisions are focused on increasing shareholder value, the individual's planning focuses on achieving his/her life goals. The company can justify capital expenditure such as plant and machinery by way of capacity expansion, depreciation benefits and corporate taxation. However, seen in this context, buying a high-end luxury car (on impulse, on EMI!) cannot be justified without adequate analysis. Similarly, intangible assets may be valued and accounted for and depreciation claimed on them, but these may not have any relevance for the individual. Some exceptions to this could be expenses towards education in various courses and buying books and journals, etc, which have long-term benefits. Education loans may also be procured, if possible. Furthermore, certain purchases like buying a vintage car, a painting or an antique piece may fall under the purview of wealth management and alternative investments. However, buying a "Mona Lisa" on EMI or on a credit card, even if possible, is definitely not justified in any manner. 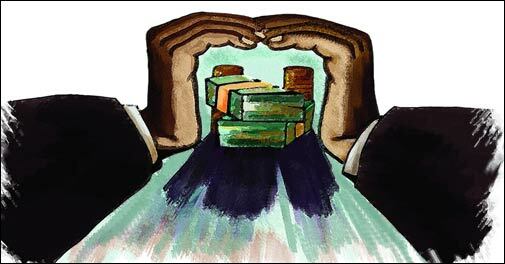 It is important that income is judiciously allocated between present and future spends. For the future, we should save and invest wisely as per our risk appetite. For the current expenses, one should be well-budgeted to be able to meet all expenses. Thus, to conclude we may say that no more than one third of one's net income should be used to service debt and savings should be at least one-third the net income. Accordingly, the expenses should not exceed the one-third net income in principle. > Put a broad limit to regular expenses so that they do not go out of control. > Look at various payment options such as zero-interest EMI while buying a valuable item. > Do not hesitate to ask for discounts and complementary services. > Before making a big purchase, surf the Internet to look for discounts. 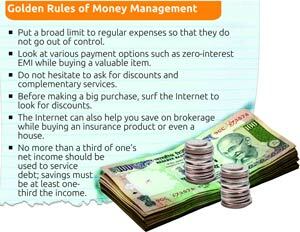 > The Internet can also help you save on brokerage while buying an insurance product or even a house. > No more than a third of one's net income should be used to service debt; savings must be at least one-third the income. The writer is Vice Chairman and CEO, Financial Planning Standards Board (FPSB) India. The views expressed here are personal and do not necessarily represent that of the organisation. FPSB India is the sole marks licensing authority for the CFP marks in India through an agreement with US-based FPSB Ltd.